A group of women supported by the charity the Lighthouse Project came together to form a collective and share their experiences to the streets and back. They all have been involved in street prostitution in Hull and An Untold Story tells the stories of their lives through poetry, interviews, prose and artwork. They share their experiences of abuse, pain and lose but also of exceptional courage and hope. They want to get these messages out there because they, and women with similar experiences face neglect, marginalisation and stigmatisation. Twelve women have contributed to the writing of An Untold Story, originally a piece of research funded by the Lankelly Chase, the stories were so powerful that they felt the voices of the women needed to be heard entirely without analysis or interpretation. The women’s stories have now gone on to be featured on BBC World Service, BBC Woman’s Hour and BBC Radio Humberside. Between the covers of An Untold Story a group of women who have all been involved in street prostitution in Hull tell the stories of their lives through poetry, interviews, prose and artwork. Here you will read of abuse, pain and loss but also of exceptional courage and hope to shatter the stigma and create understanding for these women, and others who face similar experiences. 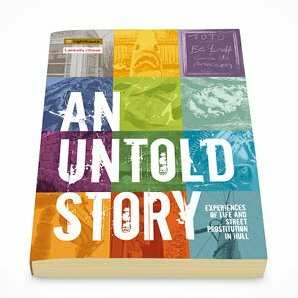 Some of the authors of An Untold Story will be telling their own stories, in their own way. Amanda is represented a group of twelve women supported by the Lighthouse Project who came together to form a collective and share their experiences. They have all been involved in street prostitution in Hull and their recently published book An Untold Story tells the stories of their lives through poetry, interviews, prose and artwork. In her talk Amanda tells her story in her own way and in her own words to shatter the stigma and create understanding for women with similar experiences who face neglect and marginalisation.